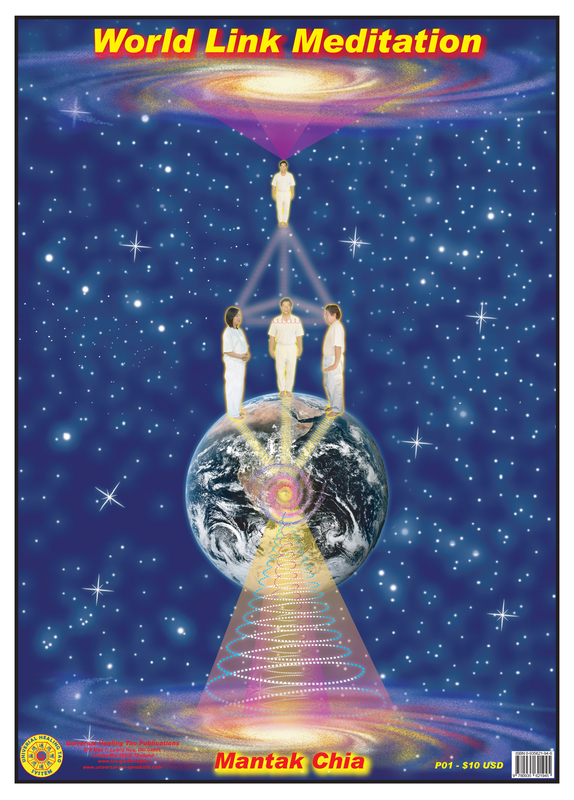 This poster illustrates sßhow to guide and connect you to others with the power of the Universe. The universe has abundant energy to enhance and multiply the enjoyment of our lives. All that we need to do is to be connected to the source. It helps to understand the principle of fusing the Three Minds. Western science now knows there are Three Minds. The World Link of Protection Healing Meditation is a spiritual practice that takes around 15 to 30 minutes. When people from all around the world link together at the same time they are greatly empowered. It can be practiced easily with the Universal Healing Tao formulas (Three Minds into One, Circle of Fire, Protective Animals & Peaceful Affirmations) then connecting the Yi Power to your Personal Star then to others' Personal Stars connecting above to the Three Colors (Forest Green, Ocean/Sky Blue & Violet Red) into the emptiness of the universe.